Juniperus communis, the Common Juniper, is a species in the genus Juniperus, in the family Cupressaceae. It has the largest range of any woody plant. It is all over the cool temperate Northern Hemisphere. It can be found in North America, Europe and Asia. Juniperus communis subsp. alpina, Vitosha, Bulgaria. Juniperus communis is a shrub or small coniferous evergreen tree. It is a low spreading shrub. Sometimes it can reach 10 m tall. The seed cones are berry-like. They are green when ripening. In 18 months they change to purple-black with a blue waxy coating. It is too small to be used for lumber. 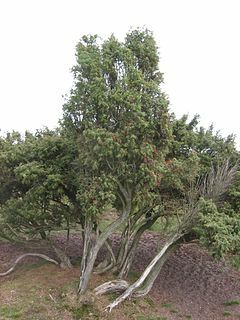 In Scandinavia, however, juniper wood is used for making containers. These containers store small amounts of dairy products such as butter and cheese. In Estonia juniper wood is valued for its long lasting and pleasant aroma. Various decorative items (often eating utensils) are common in most Estonian handicraft shops and households. Its astringent blue-black seeds, commonly known as "Juniper berries", are too bitter to eat raw. They are usually sold dried and used to flavour meats, sauces, and stuffings. They are generally crushed before use to release their flavour. The berries are used to flavour certain beers and gin. The Slovak national alcoholic beverage Borovička is also flavoured with juniper berry extract. Juniper berries have long been used as medicine by many cultures. Juniper berries act as a strong urinary tract disinfectant if eaten. They were used by Native Americans as an herbal remedy for diabetes. Western American tribes combined the berries of Juniperus communis with Berberis root bark in a herbal tea. Native Americans also used juniper berries as a female contraceptive. Wikimedia Commons has media related to Juniperus communis. ↑ Conifer Specialist Group 1998. Juniperus communis. In: IUCN 2009. IUCN Red List of Threatened Species. Version 2009.2. <www.iucnredlist.org>. Downloaded on 03 March 2010. ↑ McCabe, Melvina; Gohdes, Dorothy; Morgan, Frank; Eakin, Joanne; Sanders, Margaret; Schmitt, Cheryl (2005). "Herbal Therapies and Diabetes Among Navajo Indians". Diabetes Care 28 (6): 1534–1535. doi:10.2337/diacare.28.6.1534-a. ↑ Tilford, Gregory L. (1997). Edible and Medicinal Plants of the West. Mountain Press Publishing Company. ISBN 0-87842-359-1. This page was last changed on 5 November 2013, at 10:23.